Help Us "Get The Word Out"
1. 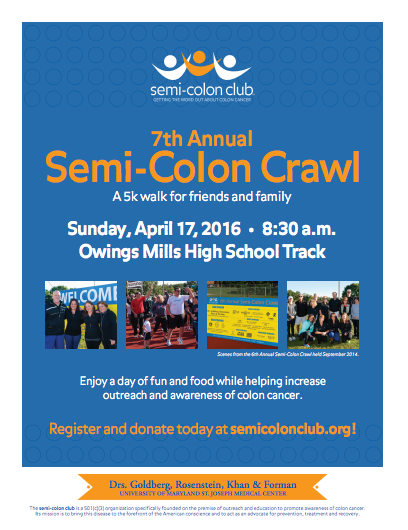 Register - all proceeds from your entry fee go directly to supporting colon cancer outreach and awareness. You can also make an additional donation or create a "Pledge Page" and set a fundraising goal to share with friends and family. 3. Donate - you can donate to our fundraising efforts, or "pledge" a participant directly and help someone reach their fundraising goals! Each year we raise money from our 5K walk to spread outreach and awareness about colon cancer. Our goal is to educate people on the importance of testing as colon cancer is one of the most preventable, treatable and beatable cancers. Monies raised in the past have gone to scholarship recipients at Owings Mills High, Hopewell Cancer Support, Johns Hopkins Hospital, and The American Cancer Society.